The best waste is the waste that doesn’t exist. Prevention of unsolicited mail is one of many ways to prevent waste and many European countries have local prevention measures in place to stop unsolicited mail. 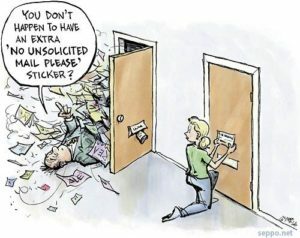 Sometimes placing a “STOP unsolicited mail” sticker on your mailbox it is enough to save moving 40kg of paper per year. Every kg of paper we discard means another kg of wood or recycled paper, 10 liters of water and 5Kwh of electricity with all its equivalent cost in €. We tend to think that this junk mail we find in our mail-boxes is for free and that’s why some people don’t care. But this is false. The cost of this junk mail, like the cost of any marketing, can be found in the price of the products that is then charged to the consumer. Plus we have to pay for the treatment and disposal of the junk-mail because the producers are not responsible for it. Prevention –first priority of the European waste hierarchy– is made of a number of small actions that will help reduce our waste generation to zero. Stopping junk mail is one of them. In Europe there are no municipal, regional, national or European laws stopping junk mail. There are initiatives to protect privacy but none to stop unsolicited mail. Therefore it is up to the individual to stop junk mail. If all Europe would stop unsolicited mail the EU would save 1 bilion € only in collection and treatment costs and 10 million tones of paper to the environment! – has a cost of around 60€ -excluding distribution- that is charged to the consummers when they buy their products. Once the mail –consumed or non-consumed- is disposed of we need to add around 4€ per person to recycle or burn the paper that is again charged to the consumers. If only 5% of the french use the “stop the pub” sticker the reduction of waste will be of 40.000 tones of paper! – 17.5 billion pieces of junk mail are produced every year in the UK. This includes both addressed and unaddressed junk mail. – To produce all this junk mail 550,000 tonnes of paper and 16.5 billion litres of water are used. – Over the last five years the overall volume of junk mail sent out has decreased slightly, by an estimated 0.2 per cent per year. – 650 pieces of junk mail are posted through the average British letterbox every year. – On average 80 pieces of addressed junk mail are sent out to the 583,000 people who die every year in the UK following their death. – 15 per cent of British households are registered with the Mailing Preference Service. Less than 0.5 per cent has opted out of receiving unaddressed junk mail delivered by Royal Mail. -The most common source for the creation of junk mail lists is the edited electoral register. Yet, only 40 per cent of voters have opted out of being on this version of the electoral roll. In Belgium, Bruxelles Environement offers the possibility to stop the unsolicited email; anyone who desires to stop junk mail can call or send an email to Bruxelles-Environement and they send a sticker for free. This simple gesture saves time, it helps us focus on the important mail, it saves us money and it saves us moving papers up and down. There is a lot of room for improvement, stop your unsolicited mail now!